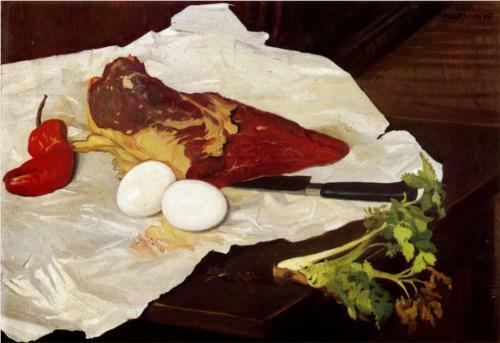 Meat, Pepper, and Eggs, Felix Vallotton, 1918. I want hamburgers often, and I want them rare. Lately I’ve liked them better than a steak. There’s something about the tenderness of a good burger, a perfect package, that when you bite into it it always seems like a little surprise (although not so good a surprise if you’ve overcooked it). Burgers are one of those foods that are both pedestrian and celebratory. I love shaping them, something you really can’t do with a steak unless for some reason you’re compelled to cut heart patterns or stars, which I’ve never seen even at any of the more far-reaching catering places I worked for. If the idea of supermarket ground meat grosses you out, as it now does me, you can easily grind it yourself. I buy a hunk of beef chuck, the best cut for burgers, since it has more fat than sirloin. If you want you can purchase grass-fed beef, which is higher in omega-3 (or you could buy ground meat at a farmers’ market, which for me is a tad expensive, but every once in a while I go for it). When grinding it myself, I cut my beef hunk into smaller pieces and then throw a few at a time into my food processor and pulse quickly. It works really well. The more you try it, the more you’ll come to feel when you’ve got a perfect, uniform chop. That way you’ll be sure your chopmeat came from one cow, not some grab bag of corporate animal sludge. Of course, you can use a meat grinder, but mine, which belonged to my sausage-obsessed grandmother, is so old and rusty at this point that the food processor works much better. Just to make it more luscious, I add a drizzle of olive oil into the mix before forming the patties. You’ve probably noticed that lately I’ve been focusing on low-carb Italian and Mediterranean, so no bun here. Of course you can have one, but cutting the carbs really does help you lose weight. That’s what many of my readers have been asking for, so I decided to oblige. I’m getting used to this way of eating. It’s extremely creative. I’m trying to present combination dishes, such as this one, that make a full meal without a carb side. They really force you to you work your vegetables. I’d round out this burger dinner with a summer tomato salad and a lightly chilled Sangiovese. At the end of the meal you can add a few peach slices to your wine, a beautiful Southern Italian touch. To make the peperonata, place the peppers on a sheet pan, and coat them with a little olive oil. Turn on the broiler, and broil them about 6 inches from the heat source, turning them often, until they’re charred all over. I like this method better than grilling outside or over a gas flame because it takes away the inner rawness that can leave the peppers bitter. Cover the peppers with a towel or throw them in a paper bag, and let them steam in their own heat for about 10 minutes. Now peel and seed them, and cut them into strips. In a medium skillet, heat a tablespoon of olive oil over medium flame. Add the pepper strips, garlic, and salt, and sauté until the garlic gives off its aroma, about a minute. Now add the sweet vermouth, and let it bubble away. Add the thyme and the mustard, mixing them in. Cook about a minute longer. Now turn off the heat, and let the peperonata sit in the skillet. This will help it develop flavor. After about 5 minutes, transfer it to a bowl, and give it a drizzle of fresh olive oil. Place the ground meat in a bowl. Add about a tablespoon of olive oil, and season with salt and black pepper. Mix gently. Shape the meat into four thick patties. Cook the patties on either an outside grill or a stove-top grill plate. I like mine very rare, but anything from almost raw to medium-rare, in my opinion, is acceptable. If you’re going to hammer them, I really don’t see the point of wasting good meat. So give them the touch test. Soft in the center is rare. Heading toward medium rare you’ll feel a bit of springiness. While your burgers are cooking, set out 4 plates, and place a few leaves of the Bibb lettuce on each. Place a hamburger on each. 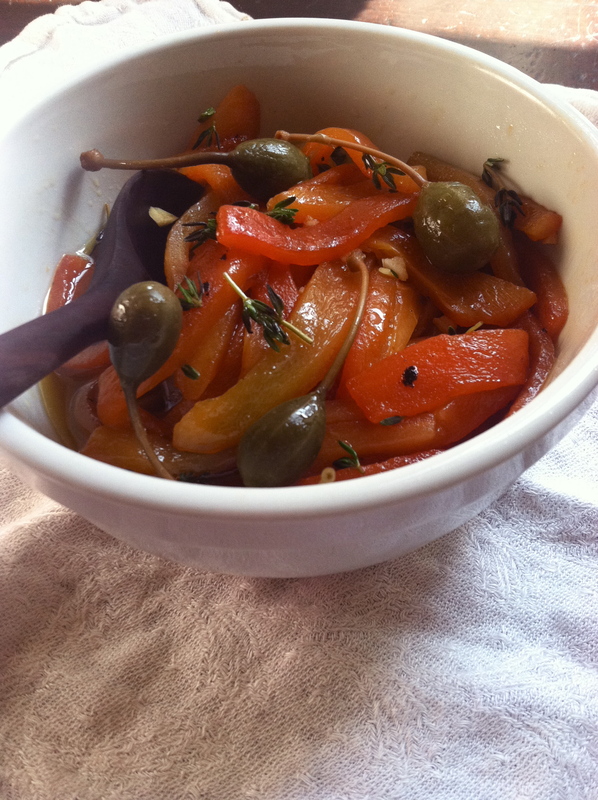 Top with the peperonata (which I think is best slightly warm or at room temperature). Garnish with caper berries and thyme sprigs. You want fries with that, lady? Sadly, no fries with this diet. But you can console yourself with a big glass of vino. No carbs in that. Of course it would never occur to me to grind my own meat. Duh! The local supermarket near the A train where I come up from work doesn’t even sell ground chuck, with the result that I have twice now made these rather dried-out burgers (even with minimal cooking) from grounds round or sirloin — no doubt the “grab bag of corporate animal sludge,” as you so hilariously put it. Love the peperonata, a nice touch. But alas, no outdoor grilling in my neighb — illegal. Where do you stand on the dread Foreman, Erica? I’m not a fan of the Foreman girls (oh, I meant grill). They squeeze the life out of anything they try to cook, leaving stuff dry and stiff (dead, I guess). Get yourself a stove top grill pan. YOu might even already have one stuffed somewhere or other. I’m also not a fan of pressing down on meat while cooking. That’s sort of like performing the Foreman grill routine without the foreman grill. I’m in favor of letting dead meat live. The key is not to hammer it to death. Dead meat needs to breath.